Hello! I’m so happy to be here as this is my first project for the Moda Bake Shop. During the warmer months we spend a lot of time outdoors and tend to eat outside as well. I thought it would nice to pretty-up our outdoor space. Using a jelly roll gives the topper a nice patchwork look and tons of color. Place 2 strips together. Line up the selvedge end and sew down the length using a 1/4″ seam allowance. Iron the seam open and grab your next strip. This time align your strip on the opposite end and sew. Changing direction for each strip prevents the strip set from curving. Keep adding strips until you have 8 pieced together. Bring your strip set over to your cutting mat and trim off one end. Leave the other end uncut. Using a ruler mark the TOP edge of your strip set at 9.5″ and 10.5″. Move your ruler edge down to your 10.5″ mark. Mark again at 9.5″ and 10.5″. Do this all the way down the top of the strip set. Using your ruler mark the BOTTOM edge of your strip set at 4.25″ and 5.25″. Move your ruler edge down to your 5.25″ mark. Mark at 9.5″ and 10.5″. Continue marking at 9.5″ and 10.5″ down the length of the strip set. Line up the top left corner and the first mark (4.25″) at the bottom of your strip set. Line up your ruler with the first mark at the top (9.5″) and at the bottom with the next mark available (originally 5.25″) and cut. This provides you with your first ‘wedge’. It should be 9.5″ along the top and 1″ along the bottom. Repeating the cuts (6 wedges) the length of the strip set. Use the next mark available on the top and bottom as your cutting guide. Each cut will be 1″ on one end, 9.5″ on the other end. Your ruler will change angles each cut. You will have enough fabric to cut 7 wedges but you only need 6. I’m saving my extra for another project. Repeat the above steps with your second fabric set. Arrange the wedges to your liking. You will have 3 wedges of edge color variant for a total of 12. Sew 2 wedges together a time. Pin each seam together – it really helps to keep everything lined up and looking nice. Then sew one more side together – leaving seam open. Find a circle approximately 3″ in diameter, trace over the center hole and cut. 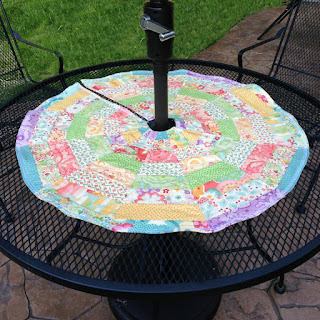 This cleans things up a bit and makes it easier for quilting. 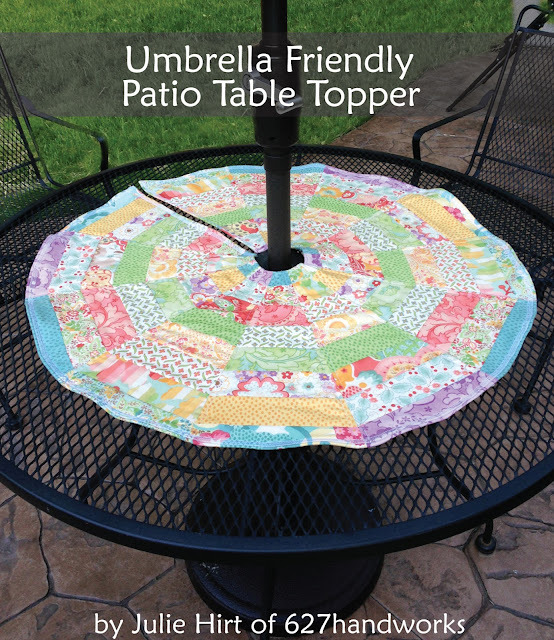 Backing fabric (pretty side down), then your batting or canvas, then the topper (pretty side up). You may use a light batting or a heavy canvas like duck cloth. I find the canvas is a little easier to work with and the finished result lays a bit flatter. The pictures below are using a thin cotton batting. Baste using your preferred method. Spray baste is a quick and easy option for this project. I chose to sew 1/4″ down the length of each side of the wedges. You can be as elaborate as you want! After quilting, trim off the batting and backing. Be sure to trim the open seam and center hole. Since we are going for a circle it makes it nice to trim a little off the points. 1/4″ or less – just enough to get the pointy part off. It should be looking something like this. If you chose to use store bought binding or want to make your own binding, now is the time to add it. If you are going to use the folding method for finishing, keep going! Baste 1/8″ all around the unfinished edges. This just helps hold all of the layers together. After basting: Starting at a corner fold under 1/4″, then fold again. Pin or clip in place. This should create a nice, tight 1/4″ double fold. Continue clipping all the way around. Due to the curving and tight fold, you will need a lot of pins or clips. Be sure you are folding under, not to the top. I find it easier to clip a section, sew, then clip another section. Sew between 1/4″ and 1/8″ all the way around the top. This will be enough to catch the folds underneath. For the final step I decided to stitch all the way around using one of those decorative stitches that I never get to use! This is purely optional. You are done! Take it outside and enjoy. 1 Jelly Roll will make 2 table toppers. If you are attending any outdoor barbeques or parties this summer these table toppers would make a nice gift for the host. This entry was posted in Home Decor, Jelly Roll, Moderate and tagged Chez Moi, Mimi, six two seven handworks, Staycations.